Isaac Strausbaugh is an independent guy. But an airborne training accident—and a subsequent partial knee replacement—changed some of that. The injury forced Strausbaugh, an Army specialist and paratrooper, into a long rehab and a pending medical retirement. While the sudden end of his military career is an anomaly, he’s still one of roughly 200,000 service members who’ll leave the military in the next year. That’s a lot of people moving between a life of service and regimented teamwork to a civilian economy built on competition and self-promotion. “I was a paratrooper and I had air assault school,” Strausbaugh said. “That’s not going to help you sell cars or work at Lowe’s. And transition isn’t just an obstacle for younger, enlisted service members. Reyes graduated from the United States Naval Academy in 1990 and served on active duty for eight years before leaving to get a master’s degree in business. Now, he’s in charge of the USO’s efforts to ease transition for his veteran peers. The USO Transition 360 Alliance, launched in May 2015, offers a holistic approach to transition through free employment and family programs via partners Hire Heroes USA, Stronger Families, RP/6 and The Comfort Crew for Military Kids. The alliance offers hundreds of in-person opportunities and workshops each year and is also building out an online portal for each of its services. “I think the one constant in [transitioning out of the military] is making sure you’re thinking very directly about your plan,” Reyes said. “And that’s not always intuitive for folks. 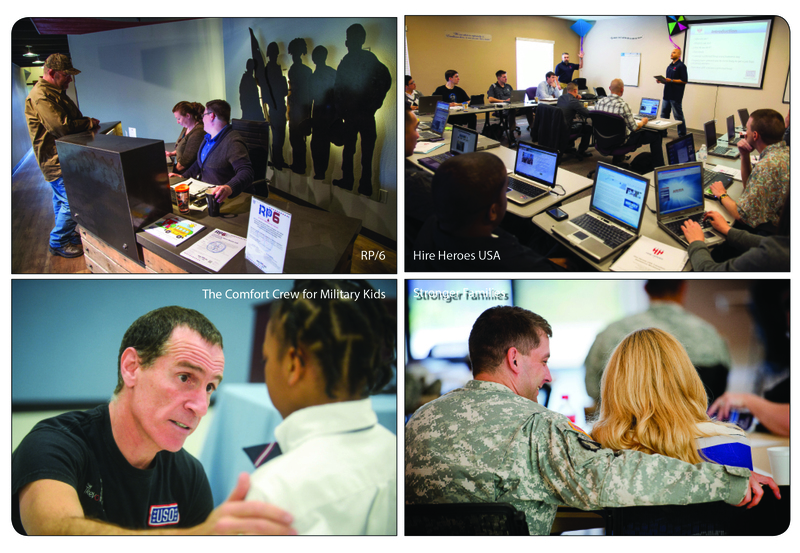 The USO partnered with RP/6 to help service members start making those plans early. Transitioning troops and their spouses can visit an RP/6 center or their online portal to find out what resources and organizations are available to help in their community. Based in Lakewood, Washington, just north of Joint Base Lewis-McChord, the USO’s investment has allowed RP/6 to expand to six centers strategically located near large military hubs around the United States. RP/6 works as a concierge service connecting transitioning military families to the civilian world by helping them address employment, benefits and quality of life issues. The alliance features more nuanced services, too, including longtime USO partner Hire Heroes USA. The two nonprofits combine to host scores of transition workshops where service members and spouses can learn resume writing from the ground up, understand civilian employers’ expectations and even polish their business interactions through mock interviews with pre-identified local employers. Its services continue after the workshops end, with Hire Heroes USA’s career coaches—many of whom are veterans—checking in on participants throughout their job search process. The USO Transition 360 Alliance expands beyond employment needs all the way into the homes of military families. The Comfort Crew for Military Kids—a longtime USO partner and member of the alliance—goes into schools around the world and talks directly to military dependents about challenges like bullying, deployments and even transition to civilian life. The USO also works with Transition 360 Alliance partner Stronger Families to help military couples tackle issues in their personal relationships. Stronger Families’ Oxygen Seminars are tailored to help couples improve communication, resolve their daily and long-term conflicts and rekindle romance. —USO Multimedia Journalist Sandi Moynihan contributed to this story. Eric Brandner is the USO’s director of story development. This story appears in the Spring 2016 issue of On Patrol, the magazine of the USO.